When I finally discovered the scholarly disciplines that resonated with me as an undergraduate student–cultural studies and philosophy–I found myself immersed in a sea of new ideas, words, people, and knowledge. I felt simultaneously completely lost and totally obsessed. In order to understand the theorist I was reading in class, I wanted to read everyone who came before her, the history of ideas in which she was embedded, and the broader social contexts swirling around her. As I look back on these years, I often think of myself as a cartographer, mapping through space and time the field and history–learning names, developing a sense of orientation, coming to know how to use a compass to take me from one idea to another. I felt as though I was “catching up” with the kinds of things people knew in my field. As I transitioned to reading and writing in graduate school, I quickly began to put my cartographic explorations to use. Discussing a therapeutic intervention in social work or a particular lens for understanding youth, I found myself referencing philosophers and theorists from my undergraduate experience. I was struck by the incredible relevance of these seemingly obtuse and abstract ideas to working at these everyday problems. The same was true when I started teaching. As I planned lessons, I sought to put my undergraduate chops to the test and help learners draw connections between what we studied in class and the broader history of ideas. I often started lesson planning or returned home from classes to dig frantically through paper files, notes scrawled in the margins of books, and computer files. Finding notes–as fragmented and incomplete as they often were–lead me to new ways of thinking, and especially, new ways of connecting ideas. In a world where knowledge is increasingly available and connectable–the kind of world where ancient philosophical ideas and recent literary work give me new insight into my teaching and research–I needed a better, more consistent and useful system for processing information I regularly encounter. A workflow should help you gather and store information in usable and accessible ways. It should also help you access that information as readily as possible, and especially should support you in building connections across disparate pieces of knowledge. I find workflow a useful term because reminds me this involves multiple, intersecting apps, rather than a single catch-all app. 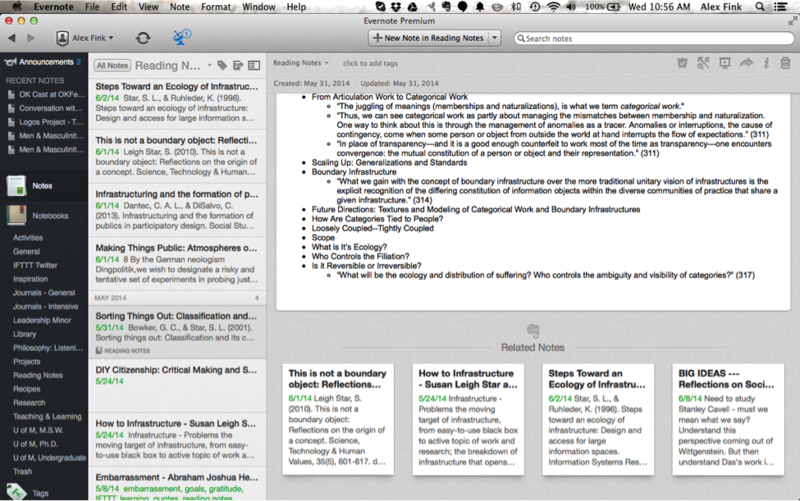 Image: See “Related Notes” section of Evernote for an example of software that alerts you to connections across areas of knowledge. As I more deeply engaged my scholarly pursuits, I find that my brain is consistently crammed with more information than I can properly remember, curate, and use without some consistent tools to help me. Not unlike being a kid and finding it very frustrating when my parents would mispronounce the name of one of my favorite cartoon or video game characters. It was so easy to remember all their names; they must be intentionally forgetting simply to irk me! But, alas, that blog post I found yesterday that connected my research literature to a different political issue, where was that again? And, as I started to write this blog post, I realized I wrote a few things on this subject in the past and wanted to find them. What did I call them again? Where would they be located? I find the amount of information I interact with on a daily basis incredibly overwhelming. And because it seems like I more and more often run into related disciplines that teach me something new about my own, I’m always trying to integrate new information into what I already know. One of the issues I face taking in a lot of data all the time is that I forget where I put things. Sometimes I even forget that I saved something (okay, actually, that happens quite a lot). A workflow makes it possible to find and recover these documents, articles, web pages, and notes. As in the Evernote image above, “Related Notes” show me notes from my history that seem to connect to this note in content. Using this feature, I often find that I’ve explored a similar topic before, but from a different angle. A workflow also allows you to collect information from within projects. When I start writing a new piece, I look through my email, Evernote, Diigo, Sente, Twitter and Google Drive apps to find out what else I’ve looked at that relates. I often find I’ve collected several scholarly articles, a few blog posts, some personal notes, and more than a few tweets that relate. These help me outline my new projects and remind me of angles I might otherwise have missed. I’m on the road every day. I cycle to school, ride the bus to work, and drive to meetings. In any given day I’m often in 3 or 4 different offices and a few coffee shops. Sometimes I have my computer, tablet, or phone, sometimes I don’t. Developing a solid workflow means I can gather new information/input anywhere and work from anywhere as well. Recently, I did some archival work that involved photographing archival documents to assemble them in PDFs. Using Google Drive, I stored these documents and commented on them. I soon found that, because these documents were in Google Drive, I was able to share them quickly and securely with collaborators joining my project. Work invested at the onset made it possible to collaborate rapidly. As a writer, I often finish a new piece and wonder whether I’ve said anything interesting, or whether everything I’ve written is perfectly obvious. I tend to forget the immense amount of work that went into thinking through a particular topic, conducting research, and crafting a solid work of writing. A workflow makes it possible to trace back the threads of your developing research. Better still, for those that aren’t historically inclined, it can help you remember elements of your project you might have forgotten. The amount of information most of us consume on a daily basis isn’t easy to remember – keep in mind, and track down when it’s “somewhere out there.” A well-used workflow allows a scholar to continuously gather information, process it rapidly, and store it for current or future use. If used rigorously, it prevents major hassles in the future and keeps things organized so that they can be used in multiple projects. I recently found myself collaborating with another writer and realized I’d written a great deal about our new topic, in a different form, several years ago. Using the workflow I developed, I was able to find this writing and immediately drive a base for our shared work. So, you want one of these yet? What’s great about currently available technology tools is customizing workflow is both possible and can involve a blend of familiar and new-to-you tools, of digital and analog tools. What will be a challenge is that you’ll need a chunk of time at the start of this transition to figure out what works for you – which tool to select and how you need them to work for you. Here are a few (semi-linear) steps that might guide the development of your own workflow. Common tasks include: Reading, Writing, Storage, Access. Personally, I read in a number of different ways and in different media, including blogs, scholarly articles, news, Twitter, websites, and PDFs. I use a different technology for each of these to assist in making this easier. To keep up with blogs, for example, I use Feedly, an RSS feed aggregator that takes feeds from a number of different blogs and news pages and places them all in one convenient app. Also the apps I for writing depends on the kind of writing I’m doing and how I will use that writing. Do you tend to take notes on the go? Do you mostly write only when you produce academic scholarly work? Do you prefer to write in the margins of documents? To assess needs, imagine as many types of writing as possible. I bet you thought I wasn’t going to ever tell you what technology to use! Well, I won’t tell you what to use, but I’ll tell you what I use. I suggest that you make use of this a starting place, and take a look elsewhere for other ideas as you build an overall workflow plan. What works well for me might not work for you personally, or might not be as compatible with your discipline. In a different post, I outline the specifics – what and why – of each of the tools I’ve personally selected; here I set out tools and ideas more broadly, and in three categories: reading, writing and storing. Feedly: RSS Feed reader, I follow several hundred blogs using Feedly on my computer, tablet, and phone. Mostly I read on my phone. Feedly has a great “Save for Later” function (which I tie in with IFTTT, more info about that later) that I use to store articles I like. The others I tend to skim. Sente: Academic reference manager (Mac and iPad only). I use Sente because it lets me sync unlimited articles for free after paying the initial purchase fee. I also like to use GoodReader on my tablet to read PDFs, and Sente was the only software that allowed me to sync easily to GoodReader. GoodReader: My go-to iPad PDF reader. There are about a million others for iOS and Android. The major features I was looking for are cloud syncing (to keep the same PDFs with my annotations and highlighting on my computer and my tablet) and robust annotation features. Diigo: Diigo is a social, cloud bookmarking software. It comes with a browser plugin that lets you click a small button to archive web pages you want to save. Using it’s tagging features, I group bookmarks by theme and by project I’m working on, giving me instant access to an archive of websites. Diigo also has sharing features, which allows me to share these bookmarks publicly, or with a specific group like the classes I teach. Evernote: Evernote is a cloud note storage software with apps on every major device. The Evernote apps have become quite robust, allowing you to store just about any kind of data conveniently, and return to edit or highlight it later. I also feed many of my other apps into Evernote (for example, when I save an article in Feedly, it also saves it permanently to my Evernote account). Twitter: I use Twitter to follow other scholars in my field(s), often finding many new links and the most up-to-date information. Additionally, I save a good number of tweets to other parts of my workflow: Diigo for new websites, Evernote for storing tweets themselves, Feedly for following newly discovered blogs. Kindle and Books: While Kindle and other eReaders have become an important part of my workflow, I still tend to opt for hard copies of books for scholarly use. Personally, I find it too much of a hassle to copy my notes out of Kindle and I find notetaking in books much more robust than on Kindle. I also like to lend books to others, which eReaders have yet to widely figure out how to do. Google Drive: This suite of apps is quickly becoming one of the de facto standards in office software. I store files directly related to particular projects in folders on Drive. I then share these with collaborators and can write with a shared set of resources. Sometimes I find myself copying files in from Sente or Evernote. While this isn’t an automated workflow (and creates duplicates, which are sometimes to be avoided), it forces me to search through my archives and organize this information in a new way, which usually gets my head into the current project in a fresher way. Scrivener: The ultimate writing software. I tend to use this when I don’t need to collaborate with others as often (like, say, for my dissertation) or when I have a lengthy project. The collaboration features leave something to be desired, but the ability to think and write in multiple modes is wonderful. Twitter, WordPress and Tumblr: What? These aren’t writing apps! But, yes they are! I use each for a different purpose. Twitter maintains a network of people that I write with and is also used to share new writing, whether in 140 character experiments or through links to lengthier writing elsewhere. WordPress powers my personal/academic blog and I use it to work out ideas-in-progress, or ideas I simply will never get to in a richer and more scholarly way. Part of my scholarly workflow is to make as much of what I do as open as possible, allowing others to learn from, use, and contribute back to my scholarly inquiry. I use Tumblr to keep track of my reading in a public way by posting reading notes. Your particular choice of social media to use is up to you, but don’t make the mistake of thinking of them as mere play – they are serious reading and writing tools! Paper and Pen: I use these regularly when in meetings, classes, or on a jog (yes, I often bring a small notebook with me). If I don’t write something down immediately, it’s often gone for good. Later, I transcribe worthy data into Evernote, but often these notes remain in the notebooks, stored away depending on their purpose. I keep individual notebooks as a set of notes on a particular theme or even a particular book. In the latter case, I leave the notebook on my shelf next to the book itself. This leads to interesting (re/dis)coveries. In some ways, storage is a combination of reading and writing. It’s where you put your data with the hopes of someday being able to reasonably retrieve it. While every workflow-maker’s dream is to have a single app that does it all, unfortunately this is never likely to be the case. The benefit of this is a strong diversity of apps to fit your particular needs. SugarSync: I chose this cloud storage software over others like Dropbox because it synchronizes already existing folders on my computer. This lets me keep a clear model of organization on my computer, where others like Dropbox force you to use a particular folder for synchronizing your documents. Much of the software I use is free. I pay for a subscription to SugarSync to get more data storage, for an Evernote Premium account because I use it so heavily, and for Sente because it fit my needs better than other apps for storing scholarly articles. However, most cloud storage offers services freely. Evernote Standard is free, with Mendeley or Zotero offering free storage of scholarly articles. It’s possible to make a workflow with a very small budget, or to spend a great deal to make everything work the way you want to. I tend toward the smaller budget, but I know others who invest a lot in this. You’ll need to spend some time learning your way around. Remember, a video or text tutorial likely exists for almost anything you are trying to do. A quick Google search should help you figure out that tricky feature. The next step is to automate as much as possible. Basic web browser plugins, like Evernote Plugin, Diigo Plugin, and apps like TweetDeck give you the ability to manage some activities within your browser. The Evernote plugin, for example, let’s me save a web page to Evernote, rather than copying and pasting text from the web page to my Evernote app. It seems like it makes a small difference, but I find that conveniences like these push me to keep using my workflow. If it was more work, I might forget about it. A relatively new app called IFTTT, or If This Then That, allows for significantly more robust automation. The app let’s you set up conditionals. To pick up an earlier example, if I save an article to read later in Feedly, IFTTT then saves that article to Evernote. If I favorite a tweet on Twitter, then IFTTT saves that tweet to Evernote. If I post reading notes to Tumblr, then those notes are saved to Evernote. And so forth to get things into the right places for finding later. A note on duplication: In workflows, duplication is often discouraged. However, I think there’s a time and place where duplication makes a good deal of sense. For example, when I save something to read later in Feedly, it isn’t easily searchable and it doesn’t connect to the rest of my data in Evernote. I use IFTTT to copy that saved article into Evernote, even though it creates a duplicate of the data, because I am much more likely to find it later. I often also save a webpage to Diigo and Evernote. I may even copy the link into a working Google Drive document for a related project. These actions get the data in the right place for me to do things later. Sometimes processes like this can be automated, and sometimes it’s just necessary to do it manually. Either way, doing it right now will help you find it again later. 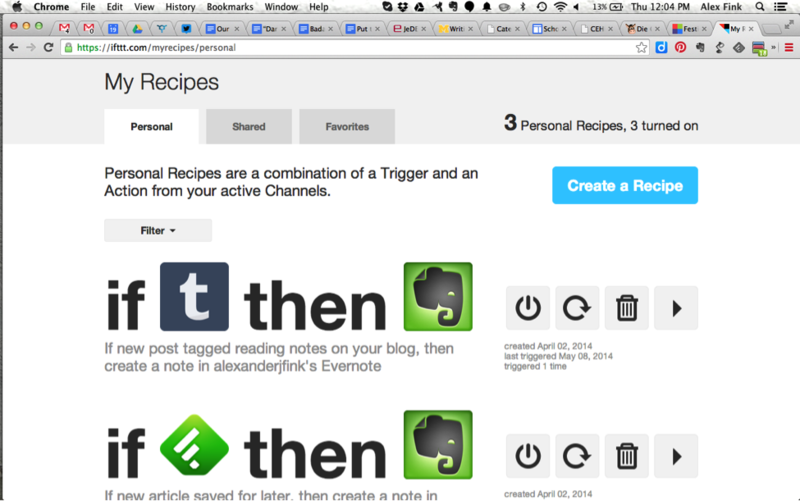 Image: Using IFTTT to build an automated workflow. Sometimes duplication should be avoided. I try not to keep more than one copy of a scholarly article – my notes become confused and they easily become lost. Instead, I keep one copy in Sente. If I annotate it in GoodReader, I make sure to keep it synchronized. If I print it, I later scan it and upload it into Sente. How you deal with duplication is up to you, but it is worthwhile to spend some time thinking what’s worth duplicating and what to avoid duplicates of at all costs. If I sound a bit obsessive about my workflow, it’s because being obsessive about it is necessary to it functioning well. My motto is that a little bit of work now saves a huge amount of work later. While others scramble to gather bibliographies, I can pull together a rich, interdisciplinary bibliography in a few minutes. While others spend hours tracking down notes on a particular topic, I can quickly gather my personal notes, related notes, text annotations, and blog or other posts that relate to the subject. And so on. That’s not to say it doesn’t take some work to keep up though. I’m not generally a particularly organized nor particularly consistent person. I’ve never been able to keep a regular journal, for example. However, spending time investing in developing a workflow and using it regularly for a couple of weeks should almost instantly be enough to demonstrate the value of keeping it up. Admittedly, I’m also a bit obsessive about my workflow itself. I follow TechCrunch, ProfHacker, and use my PLN to discover new apps and technologies that will give my ability to manage information a boost. (On PLNs see – Joe Moses‘ or Steve Wheeler’s posts.) Inevitably, I spend a good deal of time changing technologies and moving my data from one system to another. I find this keeps my workflow fresh, adds in new and unexpected elements as technology evolves, and gives me the opportunity to reflect on work I’ve done in the past. Whether or not you iterate regularly, it’s worth keeping in mind that some products keep growing and others die, and sometimes you will need to migrate from one system to another. Choose apps and systems that are easy to migrate from (ones that let you export your data is a good heuristic to start with) so you can upgrade more easily when the time comes. If all of this seems a bit overwhelming, my first advice to you is: start simple. Choose something easy and start using it. Then add and iterate over time. I began with a pen and paper, evolved to using basic note-taking software, then started using Evernote and other applications. Most important: start shaping a workflow now and use the tools you’ve set up often. Everything else will come with time. The tools referenced in this post are gathered together via the EdShelf tool under the name “Scholarly Workflow Apps” at this URL: https://edshelf.com/profile/alexfink/scholarly-workflow-app. Also, for another blogger’s take on tools that support her public and personal writing and social media communication, see Jenny Mackness’ post from 29 July 2014: http://jennymackness.wordpress.com/2014/07/29/jane-harts-top-ten-tools-for-2014/. This is a Summer 2014 post that seems good to re-blog as many of us are (re)considering how we gather and store information in usable and accessible ways. Searching through additional online resources from my new college, Metropolitan State University, I found this excellent blog post on academic writing workflows. I’m pleased to see the author uses the same software I do and motivated to do a better job of interconnecting applications to streamline the process. How does your workflow compare?